Students and parents call me in anguish: College application essays are driving us crazy. My son can’t find a topic for his Common Application essay. My daughter isn’t happy with her personal statement. What do the colleges want to hear? Why eleven tips? Because it’s not ten. Because it’s a little offbeat – but not way off. And because it’s an example of what you want to do in these essays: make the reader pay attention. No, you don’t need bells and whistles in your prose. And you don’t need to have run away and joined the circus to write an essay that stands out. An authentic personal statement – in which you and your voice shine through – is what you want. A thoughtful, heartfelt statement that reveals your interests, your strengths, something specific about the way you think and/or what matters to you – that’s where you’re headed. The central essay might be about your summer job as a cashier, your passion for pi, or how working backstage in a school play helped you get over your fear of speaking in public. Most students I work with are terrified of the Common App essay, but once they sit down to do it with the right topic, they’re frustrated that they don’t have more than the 650-word maximum. In three to five sessions, they’re usually done. Done. And then it’s on to the supplements. The more selective the colleges, in most cases, the more demanding the supplemental essays are. In addition to the Common App essay, applicants to Yale, Princeton, Brown, Stanford, University of Chicago, Tufts, CalTech and/or Harvey Mudd will be writing a slew of short answers and essays. Those applying to non-Common App colleges will face a wide assortment of essay demands: Georgetown, MIT, Wake Forest, the University of Texas and all the University of California schools. Start with a list of colleges – reaches, targets and safeties – that make sense for you. How will you know? One source of information is the application essays the colleges ask you to write. The essays reveal what the colleges want to know about you, just as what you write in them reveals what you want the colleges to know about yourself. Another great source of information is my favorite reference book, The Best 382 Colleges, published every August by Princeton Review. It’s got scads of statistics and text that describe the kinds of students who go to each and what the admissions officers are looking for. Do your grades and scores match up? Do your academic interests fit? Do you sound to yourself like the students the admissions people describe? Finally, it’s great if you can visit colleges, but these trips can be expensive, and if you’re an international student, they can be prohibitive. If a specific essay is “optional,” do it anyway, if you really want to be considered. With the abundance of students applying to 10 or more colleges, admissions officers are looking for indications that applicants are serious. Skipping an “optional” essay indicates lack of serious interest. If you’re applying primarily to Common Application colleges, write the Common App essay first. That way you’ll know not to repeat that part of your profile in other essays. Yet if you’re applying to non-Common App colleges, which sometimes require a good number of shorter, more straightforward essays, it can make sense to start with those. Writing shorter, more specific essays will help you get the hang of the essay form and might give you ideas for what you might want to write in your Common App essay later on. When doing your Common App essay, don’t let someone tell you what topic to pick. It’s natural for parents and sometimes counselors to encourage a student to write about a specific event or accomplishment that he thinks “defines” the student. Keep in mind: you don’t want to repeat what’s revealed elsewhere on your application. And: When the student picks her own topic, even with some help brainstorming, chances are it will be easier to write and sound more natural. When you turn to the supplements, tackle them strategically. When faced with a stack of supplemental essays, it’s tempting just to start at the top and keep going. My suggestion is to see which of the essay prompts overlap and do the essays in groups wherever possible. Aim for a crummy first draft. The writer Anne Lamott wrote a famous book about writing called Bird by Bird. One of the chapters is “S***** First Drafts,” which I’ll rewrite here as “Crummy First Drafts.” The idea is simple: It’s OK if your first draft – and your second and third – are a mess. The important thing is to get the story down and then edit. Edit like a writer. Words are like musical notes. When you hit the wrong ones, the sound is jarring. There are no shortcuts to writing well, but reading aloud what you write is a great way to hear how you’re doing. Better yet, read aloud to someone. Just about every professional writer I know, myself included, does this. The more you do it, the better you’ll get. Write in your “inside voice” not your “academic voice.” Consider college application essays a substitute for an interview, even if you can have an interview. The admissions office can measure your academic performance through your grades, scores, and recommendations. They can’t “hear you” except through the essays. Write in a more informal voice than you use for history papers. Write as you would write a letter to someone you wanted to get to know you. Make sure you answer the prompt. I suggest keeping the prompt at the beginning of each essay you write and checking it frequently. Often if the prompt asks several interrelated questions, it’s essential to answer each part, and it can be easier to answer each part in the order in which they’re presented. 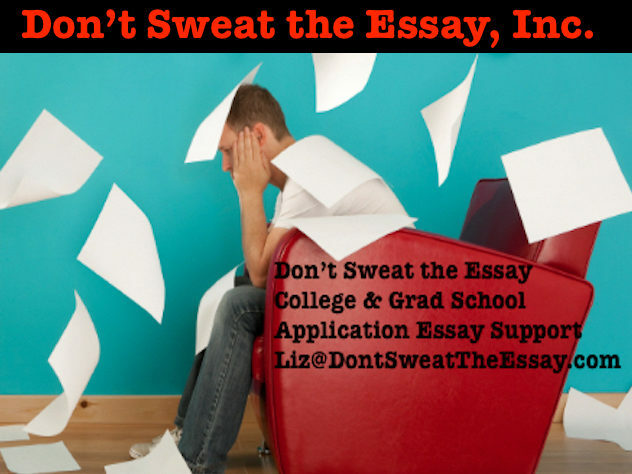 If you’d like to know more about Don’t Sweat the Essay’s approach, please email Liz@DontSweatTheEssay.com or call 1-855-99-ESSAY (Eastern Daylight Time).